So, here we are, after the chart order deadlines for Christmas and Chanukah deliveries and you're in a panic. I've been telling you all month, I am here for you. I've got you covered in so many ways that you may just want to add me to your nice list. While we can't get a chart to you by Chanukah or Christmas at this point, we can get you some gift certificates right now. Right up until December 25th. On sale, too. I know, right?! Gift Certificates are awesome because they are so easy and they ensure that your family or friends get exactly what they want. Sometimes people are intimidated to create charts for others because they either don't have access to the files themselves or they aren't sure which lines to include/exclude, or they are worried that what designs their family and friends would like. Have no fear. Gift certificates were invented for these very reasons. So just for you, I am running a sale on gift certificates from now until December 22nd. Even if you are a wait-until-the-last-possible-second kind of shopper, you can get an instant gift that doesn't come with a killer price tag. From now until December 22nd, I am offering 25% off of all gift certificates. That means you can give a big ticket item, and still keep 25% of the cost in your pocket. It's so easy and you can print the gift certificate directly from your computer immediately after purchase. Not to mention your loved ones still get a meaningful gift, to their exact specifications, with only a few mouse clicks from you. You save money and get all of the praise without the hassle and sweat. This is absolutely the best way to go as Christmas and Chanukah approach. Order anytime from December 18th through December 22nd to save 25% off of your entire gift certificate order and then instantly print your gift certificates from your home computer! You'll be the star of the show and you didn't even have to leave your house. In fact, you can order them right now, in your pajamas and slippers, and nobody will know the difference. Let me help you make it a great holiday season at your house. Or your mother's house. Or your Aunt Edna's house. 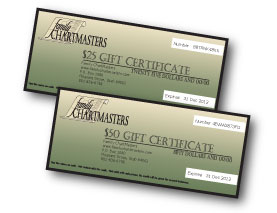 Wherever the gift certificates are going, take comfort knowing that we will help your friends and family create the perfect chart that will last for generations. That's the best kind of gift around, if you ask me!